Reviewed by Thomas J. Miceli, Department of Economics, University of Connecticut. E-mail: thomas.miceli@uconn.edu. The proper scope of a government’s use of its eminent domain power has been the subject of much debate in recent years. The debate was rekindled in the United States by the Supreme Court’s ruling in KELO V. CITY OF NEW LONDON (545 U.S. 469, 2005), which reaffirmed the ability of local governments to take private property for large-scale urban redevelopment projects provided that there was a discernable public benefit, such as the creation of jobs and enhanced tax revenues. The specific issue in dispute concerned the proper interpretation of the “public use” requirement of the Fifth Amendment Takings Clause. KELO followed previous case law by expanding public use to include any “public purpose,” thereby broadening the scope of eminent domain to encompass actions that involved spillover public benefits, even if the principal beneficiary was a private entity. 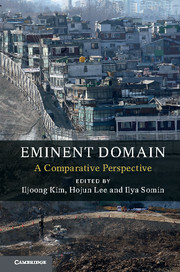 In the wake of KELO many states responded to this perceived overuse of eminent domain by enacting laws that prohibit so-called “development takings.” The current book contributes to this debate by adding a comparative perspective through review of the takings policies in several countries and legal systems. This is a welcome addition to the literature that will be of wide interest to those who study the eminent domain issue. The editors frame the debate with an introduction that identifies “six pillars” of takings law: (1) the public interest requirement; (2) permitted users (“subjects”) of eminent domain; (3) the just compensation requirement; (4) due process; (5) distribution of the development surplus; and (6) dispute resolution. These pillars can actually be boiled down to three fundamental factors. The first concerns the scope of takings, which encompasses both the public use (public purpose/public interest) requirement—that is, what sorts of projects justify the use of eminent domain—and the permitted users (pillars one and two). The issue here concerns whether eminent domain should be limited to the provision of true public goods, which are typically provided by the government and whose benefits cannot be denied to anyone, or whether it should also be available to private developers who face holdout problems or other impediments to land assembly. The academic literature is divided on this issue, depending on how public use/interest is defined. In his chapter on takings in the U.S., for example, Ilya Somin distinguishes between the “narrow” view (takings permitted exclusively for public goods or common carriers like railroads), and the “broad” view (takings permitted for any project, public or private, in which a conceivable public purpose can be identified). KELO clearly embodies the latter. The third factor concerns the procedural rules by which the taking actually occurs, encompassing both the period during which the terms of the taking are set (pillar four), and the process by which condemnees can appeal the decision after it has been made (pillar six). In evaluating these three factors from a law-and-economics perspective, it is important to keep in mind two key points. First, that there is a good economic justification for the use of coercive transfers—namely, to overcome market failures due to holdouts or other transaction costs that would result in underprovision of public goods like highways, as well as large-scale economic development projects. Second, the collective purpose of the legal safeguards surrounding the use of eminent domain is meant to replicate as closely as possible the conditions that would prevail in a consensual market transaction. It is worth expanding on the latter point to understand how the preceding factors theoretically work together to replicate a market outcome, and also why they generally fail to accomplish this goal in practice. As noted, market outcomes are distinguished by consensual exchanges, which requires that both parties to a transaction expect to enjoy a benefit. When consent is removed, however, the amount of compensation is critical in ensuring that the seller will receive such a benefit. This, however, requires knowledge of her valuation of the land. Fair market value is not a good measure of this magnitude because, as noted above, it does not account for subjective value, which in a consensual exchange is protected by a seller’s right to refuse any offer. If it were possible to accurately measure an owner’s true value, and if “just compensation” were tied to that value, then the problem of eminent domain would largely go away because takings would in effect become consensual. The problem, of course, is that subjective value is not observable, and owners, if asked, would have an incentive to overstate it. Thus, market value is substituted as the closest approximation that can be objectively measured. But because this systematically understates an owner’s true value, condemnees suffer a loss that can be considerable, especially since most takings victims are of low income and their property is often their largest asset. This is both unfair and potentially inefficient because takers do not confront the true opportunity cost of the land they are seeking to acquire. Thus, they will have an incentive to take too much. The “abuse” of eminent domain consists of this risk of excessive takings, especially in the context of development takings, which usually involve the transfer of resources from those with little political influence to powerful interest groups. The KELO case epitomized this situation, and the resulting backlash embodied an unlikely alliance between advocates of the poor on one hand and property rights advocates on the other. It is the risk of abuse that makes the public use/public interest requirement important because, in principle, it limits the use of eminent domain to those situations where it is essential for promoting social welfare. The “necessity” requirement in some countries (e.g., Germany) supports this objective by further requiring that takings only be used when it is the “mildest” way to achieve the desired objective. Finally, procedural safeguards during and after the taking provide additional institutional protections of condemnees’ rights. It is one of the themes of this book that many of the countries surveyed permit excessive use of eminent domain according to the above factors, thereby endangering the integrity of private property rights and allowing governmental overreach. In many cases, the authors attribute this not to the absence of adequate safeguards, but rather to lax adherence to them. The overall structure of the book consists of two parts. The first part, Chapters 1-5, surveys the use of eminent domain in a variety of legal systems (specifically, Germany, the United States, the European Union, Taiwan, and developing countries). The chapters are written by experts in the law of the relevant region, and the discussion in each is organized around the six pillars described above. The second part, Chapters 6-11, provides a comprehensive analysis of takings law in South Korea, with each of the six chapters devoted to one of the pillars. The special attention devoted to Korea is justified based on its extensive use of eminent domain in recent years as a critical component of its program of economic development. In [*15] addition, the editors express their hope that the lessons from the Korean experience will be of relevance for other Asian nations, especially China, where takings have also been extensively employed as part of the effort to speed conversion of rural to urban land. All of the chapters are well-written and informative, and provide a welcome comparative perspective on the takings issue, something that has been sorely lacking to date (The chapters on Korea will be of somewhat less interest to general readers, however, because they are so detailed.). The volume is bookended with an introduction and conclusion by the editors that do a good job, first of laying the foundation for the debate, and then of drawing conclusions and making policy recommendations. The tone of the book is fairly evenhanded in the sense that it acknowledges the necessity of eminent domain for providing essential public goods, but it is clearly oriented toward advocating for stronger limits on the power. While some of the chapters on Korea contain economic models, and all chapters draw on basic economic principles in making their arguments, the book is nevertheless accessible to readers without a strong economic background. There are also extensive references to the literature throughout (though it is slightly annoying that the citation style varies by chapter). In sum, I would highly recommend this book to anyone who is interested in the issue of takings, whether from an economic, legal, or political perspective. There is much food for thought and future research here. © Copyright 2018 by author, Thomas J. Miceli.